We use Tobermore block paving which can be viewed at Tobermore Paving Centre, opposite the Klondyke Garden Centre near Grangemouth. A new driveway will improve the look and exclusivity of your home. Our experienced designers will help you create a project which not only matches your aspirations and budget, but blends beautifully with your home and surrounding environment. Timber fencing is the natural material to create warmth and appeal in any area or shape, we install a wide range of traditional and contemporary timber fencing and trellises, in square or diamond pattern, with optional concave or convex tops. Back garden just completed by Derek, Dean and Shane. We explained what we were looking for and Derek made suggestions re design and slabs, which we went with. Turf and slabs lifted, base laid for log cabin, fully slabbed, scalloped edges, stones, pathway, 2 new steps, fence fixed. Absolutely delighted. The guys came on time, tidied up every night, put in a full shift everyday and completed in a week. Everything ran like clockwork from skip being delivered to completion. I feel like I have an extra room in my house now. Superb. Can't thank the guys enough. Would highly recommend. Going to get front garden done now . 5*s.
We are exctreamly happy with the job Derek and his team have done, as we only had a very slight idea what we wanted we left it in Derek's hands and he did not disappoint , our new garden is amazing .the guys were very pleasant hard working tidy and on time ,and it only took a few days. An excellent job on an awkward site. This is the second time I have used Derek Taylor fencing company . . Derek and his team were efficient and hardworking completing the task on time. They produced a quality result and I would have no hesitation in recommending him and his team to anyone. Derek & his team did a great job in difficult weather conditions. Knowledgeable & competent in all aspects of the work carried out. The guys worked non stop and completed the job in the stated time, were always happy to accommodate any change of plan, and obviously took great pride in what they were doing. Competitively priced, excellent job. Highly recommended. We can't praise Derek and his team highly enough. He transformed the front of our new home from a tired and overgrown area into a beautiful low maintenance area with a rock and plant area and huge driveway which takes several cars. We were so pleased with the result that we asked him do our back garden as well. He takes a lot of pride in his work and pays great attention to detail. Dean and Shane who work with him are great as well. Our garden is so much nicer than we ever imagined it would be and we couldn't recommend them highly enough. right from first meeting discussing our ideas, Derek's professionalism shone through. He took our ideas and put his professional experience into use and began formulating the lay-out of our garden. From day one, Derek, Andy and Dean worked totally without delay and we soon began to see our garden take shape. There were no problems or delays and the job was completed with great care. WE are absolutely delighted with the final result and are more than happy to tell everyone how good a job Derek and his boys made. Well done and thankyou guys. Derek and his team did a great job in very difficult weather conditions. They also coped well with a tricky access problem. Very competent and polite guys. We are really happy with the layout and workmanship. Competitive quote too. No hidden extras. Thoroughly recommend him. Derek and his team did a superb job at a surprisingly competitive rate, given it involved high quality material. Work done on time and with no hidden costs despite working in very difficult wintry conditions. Access was also tricky but they managed this well. His team were polite and diligent. Some minor frost heave occurred - but it was no problem for Derek to return and quickly remedy this. Definitely recommend Derek Taylor Fencing for all garden landscaping, fencing, paths and patios. derek was very good to deal with and had great knowledge of all forms of landscaping. he and his team completed a fantastic job which was more and beyond what my husband and i could ask for,few problems occured with suppliers,after few phone calls derek had it all sorted with no extra stress for us. 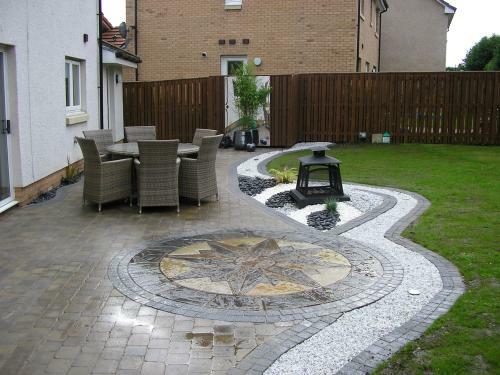 we would have no hesitation in recommending derek and his team,we will definately be using his services again, mrs e..
Derek recently created a new patio and feature wall. The end result is fantastic and is a total transformation. We were delighted with the workmanship and the speed in which the job was done. This is the second time Derek has done work for us and I would have no hesitation in recommending his company. After seeing the quality of Derek and his teams work in my local area and the feedback he had received I entrusted this company to mono block a large portion of my back garden, side of house, front drive and also landscape the front garden. I had a rough idea what I was looking for and with Derek's knowledge and vision we came up with a design. We were kept informed at all stages of the work and details were checked periodically to ensure there were no problems. He was also happy to undertake additional garden work at my request. The end result exceeded our expectations and we now have a fantastic front to our house. We would have no hesitation recommending this company to anyone!! Hugely impressed with this company. I got 3 quotes for the same work on my garden. 8x10 double door shed, 2 raised decks, new path and wheelie bin area. Levelling of garden and laying of new turf. Not only was this less than half the price of the most expensive one, but all work was done and dusted in 3 days with no mess left and there were no hidden extras to pay. Would highly recommend to anyone. Derek was happy to help out with suggestions and double checked everything with me so that there were no problems or misunderstandings. Delighted with my garden! Derek and his team were very friendly and professional and turned up when they said they would. I had no specific idea what I wanted, but Derek has the vision,and between us he created a little bit of paradise for me. We were more than pleased with the work done, and would recommend this company to anyone.